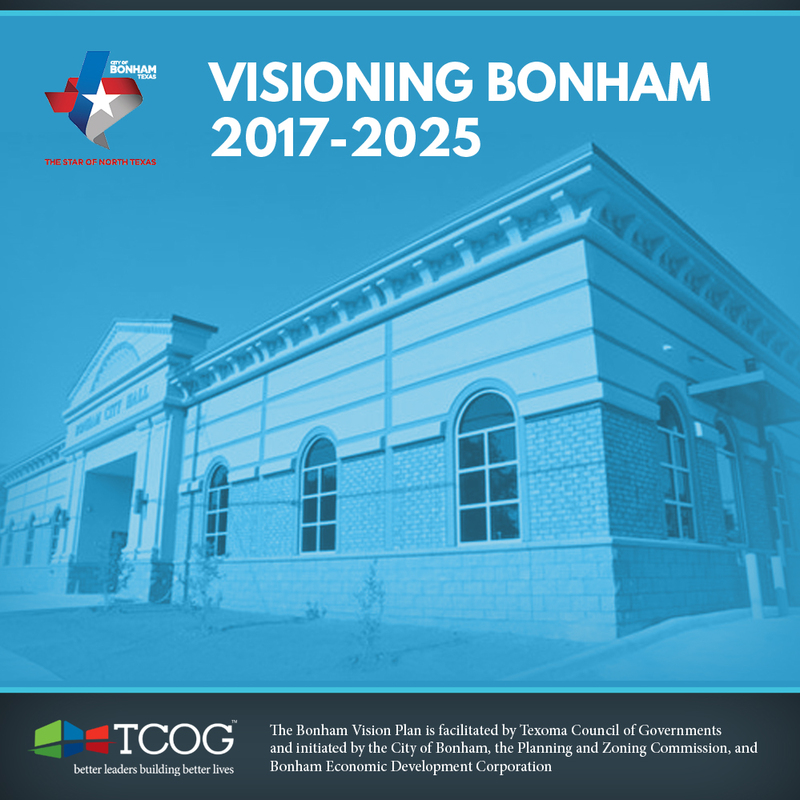 The Bonham Vision Plan, facilitated by Texoma Council of Governments (TCOG), was initiated by the City of Bonham, the Planning and Zoning Commission and BEDCO. The project team, Steering Committee, and stakeholders had numerous meetings and public forums to review data and maps, to engage in SWOC (Strengths, Weaknesses, Opportunities and Challenges) exercises, as well as focused Values and Visioning sessions. The process of visioning enables the community to define the future they want while identifying and incorporating community assets and understanding where improvements are needed. Visioning is an important tool for community and economic development that assists cities in preserving what works while preparing and addressing needs for the future. The plan analyzes several areas including annexation, parks and greenspace, housing, Infrastructure (broadband, transportation networks, water, and sewer capacity), workforce, and zoning, all in light of projected & planned growth. This plan is not designed to serve as a comprehensive review or plan, but rather an overview that will allow prioritization by the implementation team. The plan produced several strategic initiatives that will be addressed by an “Implementation Committee” appointed by Bonham City Council. At that time the next steps (goals, actions, metrics, responsible parties and more) will be discussed. Plan for and embrace change and growth to provide the optimal quality of life for the people of Bonham. Zoning and annexation will be strategic, and in accord with these values and this vision. Call if you can, text if you can’t!